When you join the Mastermind for Graphic Recorders, you change the way you operate your Creative Business. This course is designed for students who desire more support in launching and building their career as a Graphic Recorder/Visual Thinking Expert. Students who are ready to attract clients but are not sure where to start. They have questions about explaining their role as a Graphic Recorder, selling their new skill, technology & social media, and knowing how to build their portfolio to attract the right kind of work. They want to bring Visual Thinking skills into their current work, and they want to create new work from it. They also want to be part of a community where they can practice their skills and receive feedback from people on the same journey. Is this you? 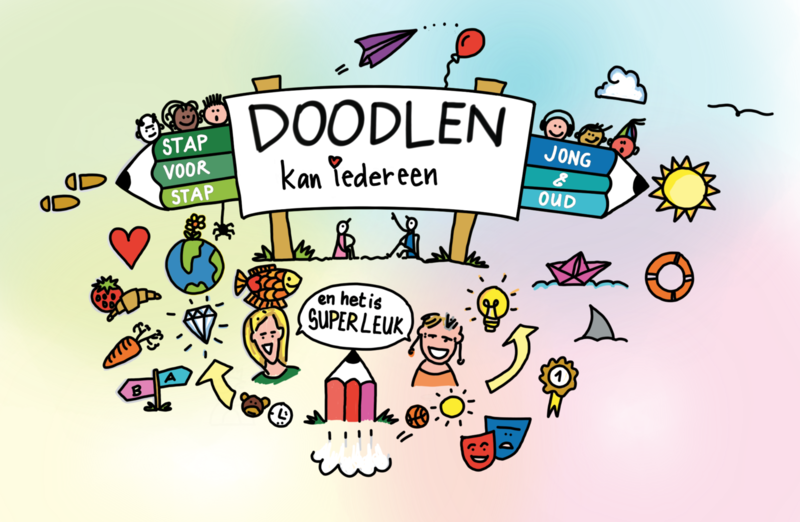 Are you ready to Doodle 4 Dollar$? WHAT IS THE MASTERMIND PROGRAM? The Doodle 4 Dollars Mastermind Program includes ONLINE COURSES, CREATIVE EXERCISES, GROUP PRACTICE ACTIVITIES, and GROUP COACHING CALLS, as well as the opportunity for PRIVATE COACHING with DIANE BLECK. This is truly a program like no other, designed to encourage, support, launch, and transform your career. WHEN ARE THE GROUP COACHING CALLS? The GROUP COACHING CALLS are on Fridays at 12:00 PM Central Time. On January 25, we begin with weekly calls for 6 weeks, and then we'll have two calls per month for the remainder of the program until our special Graduation Call on June 21. See below for a listing of all the call dates! Yes, all calls are recorded and uploaded for you to replay later. HOW DO I JOIN THE GROUP COACHING CALLS? We use ZOOM for all GROUP COACHING CALLS. This allows us to see each other face-to-face and get to know each other more. DO I HAVE TO COMPLETE THE DOODLE YOUR DREAMS PROGRAM BEFORE I CAN JOIN? It is helpful if you have taken some of the courses in the DOODLE YOUR DREAMS PROGRAM, but it is not a requirement. IS THIS THE SAME COURSE AS THE "BUSINESS OF DOODLES" COURSE FROM THE DOODLE YOUR DREAMS PROGRAM? No, Doodle 4 Dollars is one of our Professional level courses and has different content and a different format than Business of Doodles. WHAT WILL I LEARN IN EACH MODULE? 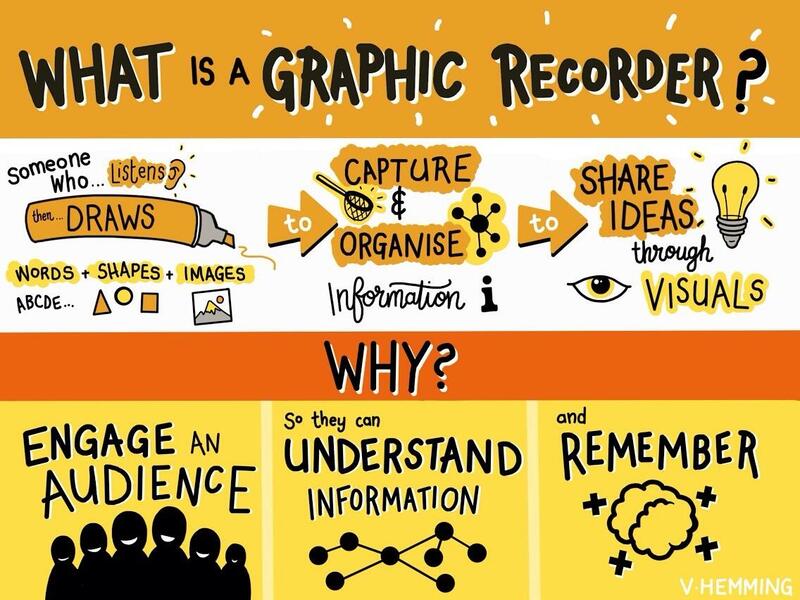 • What is Graphic Recording? • Why is Graphic Recording a Growing Industry? • Who is your industry? • How do you learn? • How do you listen? • What is an art critique? • Why do you need a portfolio? See below for all the call dates! Contact us at support@doodleinstitute.com and we'll get back to you soon. All Calls will be held on Fridays at 12:00 PM (Central Time USA) - mark your calendar! We begin with weekly calls for six weeks, then continue with calls twice per month. She replied, “Why not you? They are not hiring you because you're an artist, they are hiring you because you help them think.” As a dear friend and mentor, she saw more in me than I did at the time. Once I got over my fear, the experience was truly amazing and Disney became my biggest client for five years and launched my career! I remember a promise I made to myself. I promised I would always mentor and coach others starting out in this industry. If it weren’t for great mentors, I am not sure where I would be today. As a pioneer in the Graphic Recording/Graphic Facilitation industry, I now host a formal Group Coaching/Mentoring Program every year called, “Doodle 4 Dollar$”. It is a term I coined in an interview in 2001. It was a fun way to explain my job. During the Doodle 4 Dollar$ MASTERMIND, I work with a small group of students getting to really know them. We spend the first six weeks together on weekly calls. This time together builds a strong foundation. During this time we also going through what I call “Graphic Recording/Visual Thinking” Boot Camp. Next, we spend the rest of the six months meeting twice a month for lessons, coaching, and workshops on building your business model, refining your design skills, expanding your social media and developing client relationships. I truly share as much as I can from building a business (writing contracts, putting together your tool kit) all the way to developing your skills and confidence to land your first gigs. Students share with me that this course is essential for all areas of business, in all industries. The world is changing and people with Visual Thinking skills are in high demand! Being able to show your creativity at work is a way to stand out, get your work noticed, and become a sought after creative business talent. At the end of our time together in the MASTERMIND, students truly are transformed. I can't wait to share this journey with YOU. Murielle helps women build the path to their better self and picture their successful life of tomorrow. 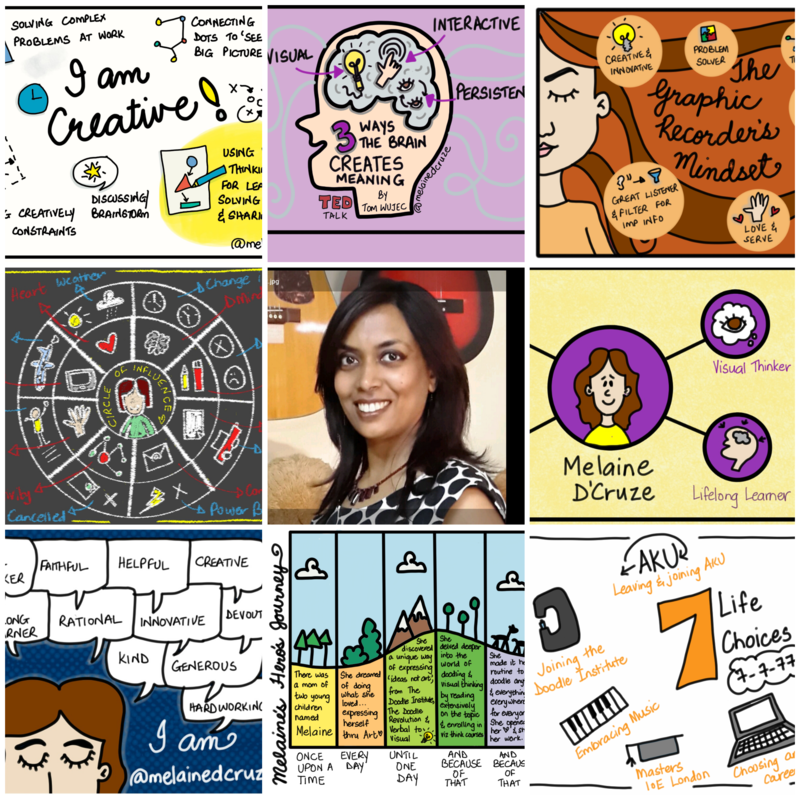 Doodling and sketchnoting are the number 1 tools she uses in her professional activities of coaching and training. 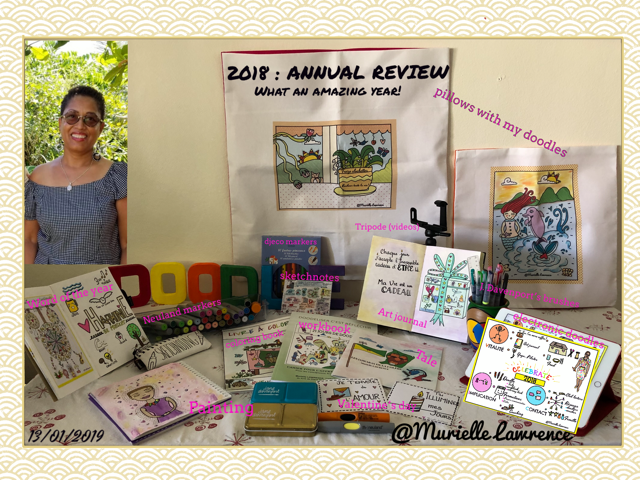 In 2018, she created three books: a tale about the social contest in French Guiana, a workbook in French -- 21 jours de doodle from Diane Bleck's 21 Doodle Days, and a coloring book called Joyeuses Fêtes (all available on Amazon!). She's also making doodle products like pillowcases and t-shirts. "When I registered to Doodle 4 Dollars, I had no idea of the world I was stepping into. After almost 2 years, I am just grateful that I made this decision. It totally changed my life at home and at work. Today I am completely a doodle addict!" Melaine D'Cruze currently works at a university as the planning & operations manager. She is an avid visual thinker and uses doodling to help with learning, problem-solving, and idea sharing at home, school & work. "The Doodle Institute has been a beacon of transformation and change for me. The Doodle for Dollars Mastermind, in particular, has helped me put pen to paper and make my ideas come to life!" "I am your doodle student from Saudi Arabia. I made a business from doodles. I give workshops to teachers and students. This year l am working on my book in the Arabic language about Sketchnote Basics. Thank you so much for inspiring me!" Karla is a Graphic Recorder with curiosity, creativity, and love for colors. She helps her clients draw out ideas, processes, and visions, and teaches them the power of visual language. Her professional skills are planning and programming in one of the largest law faculties in the Netherlands. "I'm very thankful for all the things I learned as a member of the Mastermind group. Diane's enthusiasm is contagious, and her personal support helped me to be confident, and have the courage to trust myself while developing completely new skills." Vicky empowers businesses through Creativity, by inviting Visual Thinking into the workplace. She believes Creativity can help you stand out, be memorable, enable you to see the bigger picture, engage your customers, and get your voice heard! "The Mastermind has been quite an adventure! The experience is invaluable and I feel I have grown even more in my confidence and competence. Where you have helped me most is in believing anything is possible - by modeling what is possible through so openly and transparently sharing your own experiences! Thank you for nurturing and encouraging me." "Diane and the Doodle Institute came into my life almost 3 years ago. I was given a free introductory course and quickly got deeply fascinated with learning all about visuals. I‘m a Speech Therapist and at first, I didn’t make any connection between my work and what I was learning at the Doodle Institute. And THEN I started using visuals with my patients... and saw REMARKABLE results! When Diane announced the Doodle 4 Dollars Mastermind I didn’t have any vision of becoming a Graphic Recorder, but something in me wanted to go deeper and learn more about this with a group of like-minded enthusiasts. As it turned out, signing up was a VERY good decision! What stood out most for me was the community and the way we learned with and from each other. The live calls were amazing and Diane supported us in such beautiful ways. I learned so much through the video lessons and Diane‘s input both in the FB group and during the calls. I never imagined this would be anything but a course to refine my tools for my speech therapy practice and an inspiration for my personal journey, but 2 years later I actually founded a second business focusing on supporting other people through visuals. Since then I‘ve taught university students to learn (and teach!) better with visuals, I gave workshops on how to make team meetings more effective with the power of visuals, and I produced hand-drawn visuals for clients to convey their information in more engaging ways. I also started to work as a Graphic Facilitator which has been a great joy! I feel that this is just the beginning of my journey and I‘m looking forward to seeing more wonderful opportunities unfold in 2019! Thank you, Diane, for your support and guidance along the way - I couldn’t have imagined all of this!" A Mastermind designed to build your skills, confidence and toolkit as a Graphic Recorder.